4:33 PM PT — Avenatti has just been released on a $300,000 bond. He didn’t have to pay that amount, but it had to be co-signed by 2 people who say they’re good for it. While he’s out on bond, his travel will be restricted to New York and California … and all travel plans must be approved by the government. Avenatti is also barred from contacting Mark Geragos. 1:15 PM PT — The Nike indictment says Avenatti had an unnamed co-conspirator, and we’ve confirmed reports it is famed attorney Mark Geragos. If you recognize the law firm — Boies Schiller Flexner — the “Boies” is David Boies, the famous high-powered lawyer who’s represented everyone from Al Gore to Harvey Weinstein. 11:55 AM PT — The NY Presser just finished up, and prosecutors there had quite a bit to say about Avenatti’s alleged extortion efforts toward Nike. Prosecutors in NY say the alleged Nike scheme played out over the course of a few days last week. Avenatti repped an AAU coach whose team had just lost a Nike sponsorship worth $72k a year. The coach claimed that Nike made payments to families of some high school basketball players, and Avenatti demanded payment from Nike to keep him quiet. He was arrested Monday at the location where he was supposed to meet with Nike brass, presumably to strike a deal or keep the convo going. For the record .. the only thing that was coordinated between NY and California was how the bust would go down. That said … these are two separate federal cases. 11:33 AM PT — The L.A. Presser just wrapped, and investigators didn’t pull any punches in condemning Avenatti’s alleged criminal behavior … calling him a “corrupt lawyer” who was only out for his own personal gain. Among the most damning allegations in Avenatti’s financial case … Avenatti allegedly siphoned off a $1.6 million settlement he scored for a client in 2017 and hid it in a personal bank account that he controlled … but never told his client a thing about it. The U.S. Attorney alleges Avenatti used that money to fund his lavish lifestyle and to help pay for his coffee business in California and Washington State. All the while, the client never received a penny. What’s more … the U.S. Attorney and the IRS also claim Avenatti defrauded a bank for millions of dollars worth of loans by submitting fake tax returns between 2011 and 2013, in which he claimed to have earned around $4-$5 million a year each year and supposedly paid $2.8 million in taxes. The government says all of that was a lie … he didn’t file taxes those years at all. 10:50 AM PT — There will be 2 news conferences … the U.S. Attorney in L.A. will address the wire fraud charges at 11 AM PT, and the U.S. Attorney in New York will address the Nike extortion case at 11:30 AM PT. TMZ will live stream both news conferences. The DA’s office also prepared a chart with the breakdown of the alleged extortion timeline in NY. Michael Avenatti has been arrested and charged with trying to extort $20 million out of Nike. The feds claim Avenatti told Nike’s lawyers if they didn’t pay him between $15 million and $25 million he would hold a news conference on the eve of Nike’s quarterly earnings call and the start of March Madness and announce allegations of misconduct by employees at the shoe company. According to the complaint, Avenatti demanded Nike hire him to conduct an internal investigation for the enormous salary. The U.S. Attorney for the Southern District of New York says Avenatti was representing a client who was the coach of an AAU Youth Club basketball team. Prosecutors say Avenatti gave Nike an option … don’t hire him but pay $22.5 million to resolve the dispute and buy his silence. 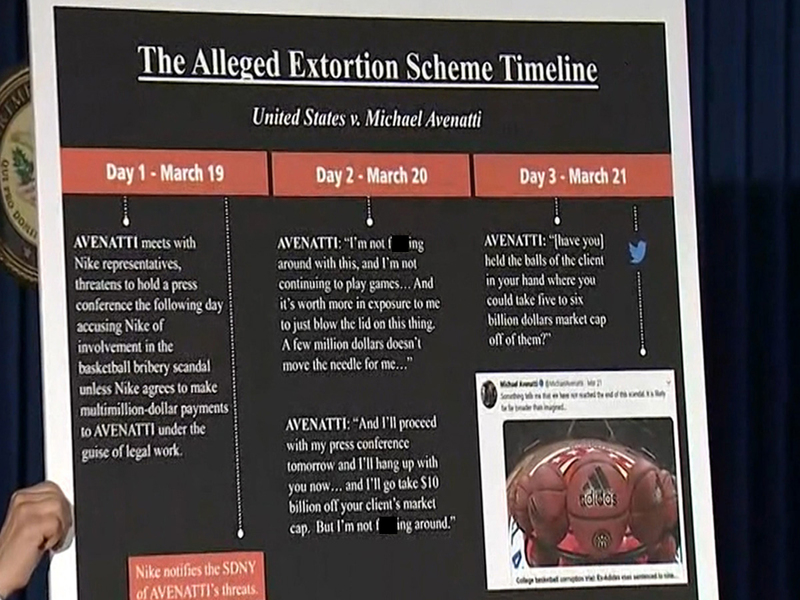 The complaint says Avenatti claimed the AAU coach had evidence that one or more Nike employees had funded payments to the families of top high school basketball players and attempted to conceal those payments. That’s not the end of it … Avenatti was just arrested for more federal crimes … bank and wire fraud. The U.S. Attorney in the Central District of California claims Avenatti embezzled client money to cover expenses for his coffee corporation which operates Tully’s Coffee stores in CA and Washington. As for allegations of bank fraud, prosecutors say Avenatti submitted false tax returns to a bank in Mississippi to get $4.1 million in loans. To get the loan, Avenatti claimed he had paid nearly $3 million in federal taxes in 2012 and 2013. Prosecutors say, in fact, Avenatti paid zero and still owed $850,438. We reached out to Avenatti, but we could not get through.